Sapphire is one of the most valuable, historically important and valuable gemstones. Sapphire includes red except Ruby. (Sapphires is judged for strong fragrance (ability to reflect light like a mirror), and violence: Sapphire is the hardest rock next after Diamond. This means they can be worn on rings and bracelets for centuries. Sapphire is a single crystalline form of aluminum oxide (Al2O3), a mineral known as corundum. The corundum group includes pure aluminum. Small amounts of other elements such as iron, titanium and chromium give blue, yellow, pink, purple, orange, or green to the blue sapphire. Sapphire types include very hard stones that have a value of 9 from Scale 10 Mohs. One of the most expensive gemstones is Sapphire, which is a type of mineral Corondum. Some types of sapphires such as Sapphire, Red Sapphire are known as Ruby, Sapphire Orange which is known as Padparascha, Violet (Violet), Green Sapphire and White Sapphire. The most preferred sapphire is Blue Sapphire. The most important factor for blue sapphire is color. The more intense the blue the higher the value. Clarity is a second value factor, high quality sapphire must be eye-clean. This means that you don't have to be able to see any inclusion with the naked eye. 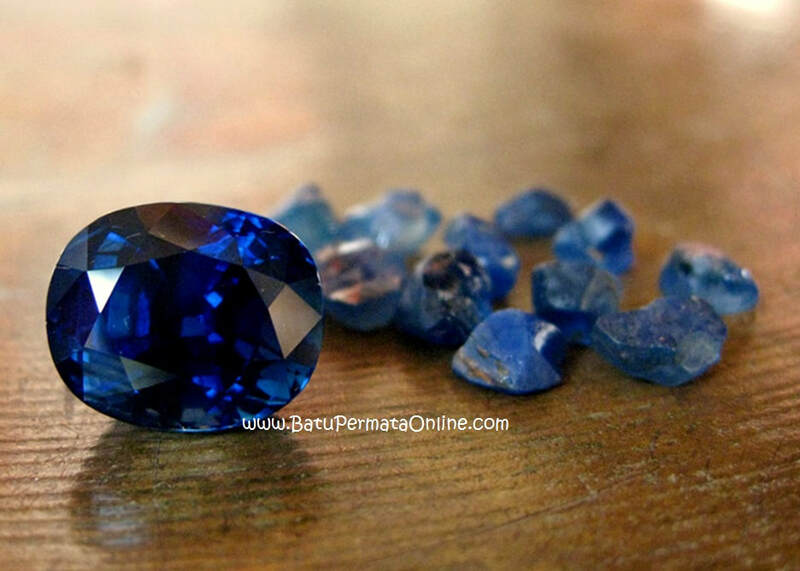 Sapphire is widely found in Sri Lanka and Khasmir. beauty, majestic colors, transparency, but also perseverance and endurance are the qualities associated with this gemstone by gem lovers and specialists alike. Blue Sapphire includes all variations in the quality of corundum minerals except those that have a full saturated red color, known as Ruby (Red Pomegranate). The best sapphires come from Sri Lanka (Ceylon) and Khasmir (India), of which the two types of Sapphire are most sought after because of their excellent quality. Sapphire symbolizes wisdom, majesty and honor for the wearer. Color variations: Blue, purple, yellow, orange, black, clear. Bias Index: 1,766 - 1,774. Specific Gravity: 3.47 - 3.55. Color: The sapphire color is one of the strongest determinants of its value. Blue sapphires come in various colors. The brightest, most valuable one. Cut: Most sapphires available in jewelry are quite poorly cut. Perfectly cut sapphires are usually only available in the best jewelry and their prices reflect premium. Treatment, Synthetic and Imitation (Treatments, Synthetics and Imitations): Sapphires are often synthesized and imitated by other substances. In addition, almost all natural sapphires experience a kind of processing. Meanings and symbols (Meaning and Symbology): Sapphire has been worshiped for centuries throughout the world. It is rich in symbolism and special healing properties.